Not many Dwarf Canna plants I grow actually stay short, they often only show their first flush of flower at a true dwarf height but by the end of their growing season they are at a much taller height. With this in consideration I have listed only those that eventually reach up to one meter tall. Short growing cannas are ideal for potting up and being placed on the patio and for planting amongst low growing garden bulbs. These low growing cannas are also known as Pixie, Mini, short dwarf plants, but they have never stayed as true short plants for me, these are the maximum height I've had these in ground plants reach over my long growing seasons. Heights are measured from the soil to the top of the flowers. 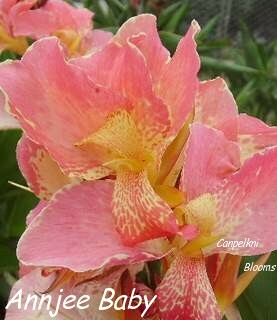 Canna Annjee Baby, grows up to 1 meter tall. 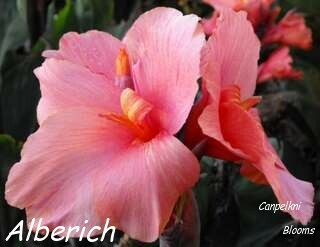 Canna Alberich, up to 90 centimeters tall. 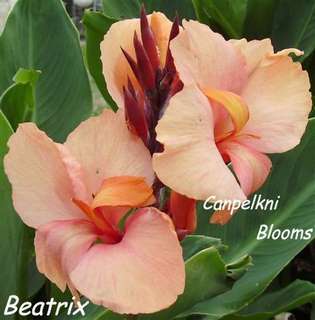 Canna Beatrix, grows up to 1 meter tall with beautiful big flowers of soft apricot and pink held above green foliage, Beatrix grows upto 1 meter tall, personal favourite as it always looks great. 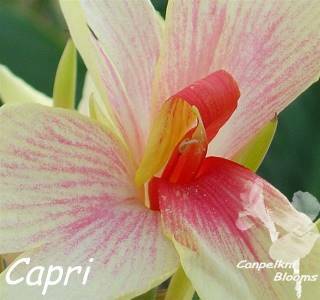 Canna Capri heritage plant with delicate shades from yellow through to cream blooms with radiating rose pink tones, the flowers tend to bleeds more pink in cooler weather, green leaves, Capri grows up to 1 meter tall. 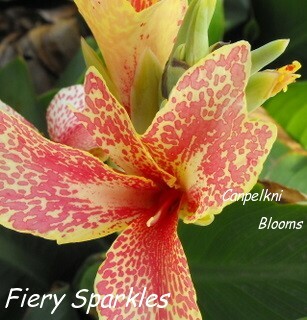 Canna Fiery Sparkles, grows up to 1 meter tall. 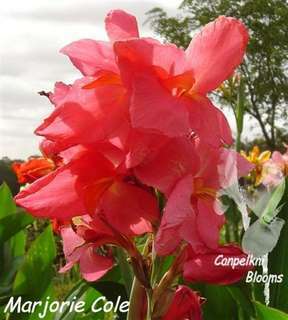 Canna Marjorie Cole, up to 80 centimeters tall. Canna Louis Cottin, up to 80 centimeters tall, a recent introduction to Australia with copper yellow through to soft apricot flowers, a short canna at 80 cm tall with bronzed leaves. 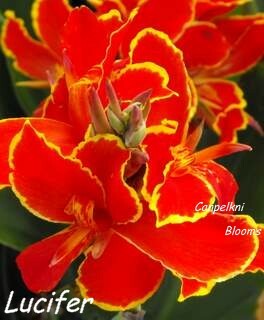 Canna Lucifer scarlet red with a sharp thin yellow border, stamen and labellum splotched, green foliage, up to 1 meter tall in the garden, quite a distinct garden plant. 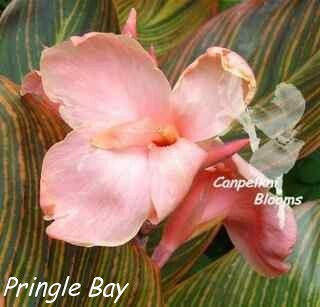 Canna Pringle Bay, mid pink blooms, variegated leaves of green overlaid with stripes of yellow pink and red, up to 80 centimeters tall in the garden, this dwarf canna originated in Africa, also known by the name canna Pink Sunburst.